CloudVOTE is a service that enhances EZ-VOTE Connect by allowing participants to use mobile devices to respond to polls asked within the desktop software. CloudVOTE connects our desktop software to the cloud, providing a centralized location to store presentation content, aggregate report data and integrate with 3rd-party systems. CloudVOTE allows your students to use phones, tablets, laptops, or any device with a web-browser to participate in audience response polling. To include mobile participants into a polling session simply select the mobile polling button within the EZ-VOTE PowerPoint toolbar. Participants can use their audience response keypads or mobile devices to respond quickly to questions and polls. 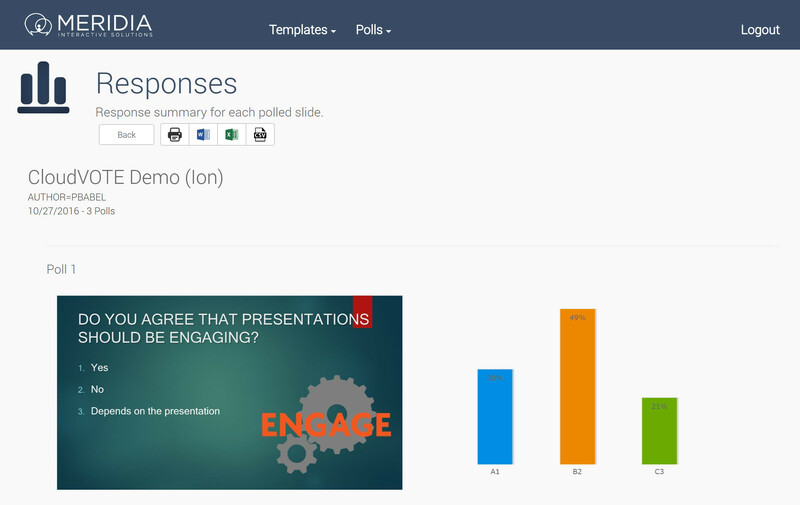 Try a demo session with pre-loaded presentation. 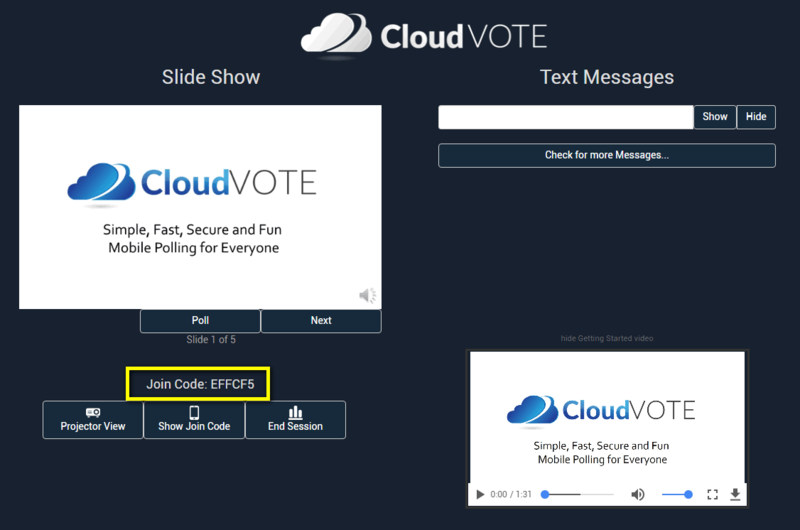 Invite your audience to go to www.cloudvote.com, click Join Now button, and enter the code that you’ll see on your Operator Screen. CloudVOTE is more than just an interactive mobile polling system. Many use it to centrally store, manage, and protect their presentation content. If you are looking for a single location to distribute your PowerPoint presentations from, using a format that cannot be edited, CloudVOTE is the perfect solution. Subscribers have access to every presentation uploaded to CloudVOTE simply by logging into their account. These “templates” can be shared among a team and presented and polled on as many times as you wish. Individual polled sessions can easily be reviewed from the same location and reports can be generated and shared with others. Every EZ-VOTE session can be stored online for ease of access and repeated use. Our CloudVOTE service collects every vote logged by participants and organizes the data into online reports. The reports are available immediately after a session has ended. 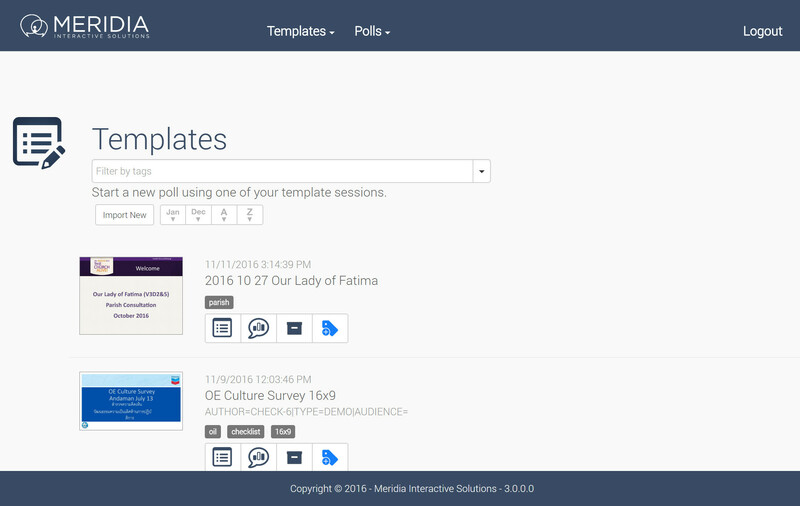 The data can be sorted by date or name to best manage your polling content. Each report includes question slides, graphs, and tables, which detail how each participant responded to the questions. The reports can also be viewed locally within EZ-VOTE, or in CloudVOTE web portal. CloudVOTE routinely integrates with 3rd-party Learning Management Systems to satisfy the needs of our large enterprise clients. Data collected within CloudVOTE can be organized and exported to systems of your choosing. Data can be stored within our cloud, or simply passed directly through to a LMS or alternate database. Implement nightly, or otherwise scheduled, direct SFTP transfers between CloudVOTE database and your LMS to ensure the most up-to-date training results are being considered by your Training & Development team, or management.